The Juke has emerged in production trim from Nissan’s European design centre in London (after some refinement at head office in Japan) ahead of its world premiere at the Geneva motor show on March 2 and its European release in the final quarter of 2010. 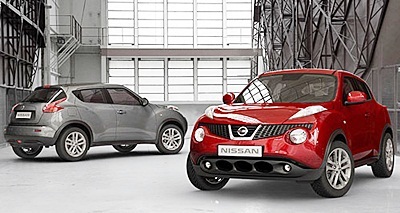 Just as the Nissan Murano was built as a city slicker, and the Nissan Dualis followed as a crossover competing with traditional small cars, the even smaller Juke has the same high-riding sports flavor but with exaggerated, blokey body styling which is in stark contrast to other models in the “sober, safe” (Nissan’s words) B-segment. I am glad they have been happy to call the styling “blokey”, for me it is just “jokey”. But to ram home the point, Nissan’s press material is peppered with references to the Juke’s “tough solid body”, “maverick design” and “masculinity and dynamism”, while the designers admit to drawing inspiration from rally cars and motorcycles - and the cabin’s high-gloss centre dash stack is meant to look like a motorcycle fuel tank. Juke will be built in England and Japan, off the same Renault Nissan Alliance B-Platform as the Micra and other models such as the Renault Clio - an architecture that enters a new stage, beginning with the new Micra, known as the V-Platform - but the crossover’s underpinnings have been lengthened, widened and strengthened. The suspension is a conventional MacPherson strut front and torsion beam rear design, with a new cradle-type front subframe introduced to enhance the lateral stiffness of the assembly. Four-wheel drive versions benefit further from a new multi-link rear suspension, which Nissan claims will place the Juke’s handling “at the top of the class” in spite of its higher ground clearance. The luggage compartment has a maximum volume of 251 liters and, on two-wheel drive versions, includes an underfloor storage area. The rear seats are split 60/40 and are said to fold in one simple movement for a “totally flat” loading floor. Where have you read those outrageous claims before? Last week I mentioned that Pope Pius XI’s Nurburg Popemobile was a present from Daimler-Benz AG. I asked what was interesting about the wheels? The correct answer was that they were wooden, and in fact Daimler-Benz was the last auto manufacturer to provide wooden spokes all the way till 1939! So to this week. Between 1920 and 1928, A.B.C. light cars had a peculiar fuel filler cap. What was it? Ever bought some fuel and a few kilometers later the car begins running like the proverbial hairy goat? You have just been scammed with dodgy fuel. Not only is 91 octane sold as 95 and Diesel B5 is sold as diesel B2 but also alcohol mix cocktails are produced and sold to increase profits. The Thai government thinks it has found the way to fix the scammers by legislating colored fuels and from February 1, 91 octane petrol will be yellow, 95 octane will be blue, and diesel B5 will be red. 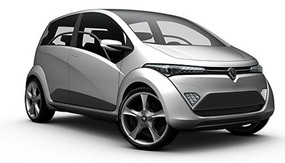 Proton and Giugiaro have jointly revealed the concept version of a striking new city car that will become the Malaysian national car-maker’s first hybrid model. Expected to go on sale around the world next year, the as-yet-unnamed vehicle will be previewed by a show car to debut at the Geneva motor show on March 2. The smartly-styled five-door hatchback, which is just 3550mm long (160mm shorter than Proton’s tiny Savvy - available in Thailand) and features four identical and independently sliding seats, was designed by the Italdesign Giugiaro design studio. Expected to closely resemble the forthcoming production version, it is built on a new Giugiaro-designed platform featuring a higher than usual roofline and floorpan to accommodate the hybrid system’s rear-mounted lithium-ion battery pack while offering cabin space that’s claimed to match many mid-size vehicles. The hybrid system incorporates a front-mounted internal combustion engine to charge the batteries which, in a similar arrangement to GM’s Volt plug-in hybrid, drive the front wheels exclusively at all times. The team at the Center for Automotive Research at Stanford (CARS) are aiming to send a specially-equipped robotic Audi up Pikes Peak without a driver - something that hasn’t been done before. Hope they tied all the equipment down. Pikes Peak, Colorado Springs, has 156 turns and a climb of 4,720 ft. An official contest for human drivers will take place in June, but the Audi will attempt a timed run in September, alone on the track. “Our first goal is to go up Pikes Peak at speeds resembling race speeds, keep the car stable around the corners and have everything work the way we want it to,” said Chris Gerdes, program director of CARS and leader of the graduate research team. Following on from past impressive results - winning its first autonomous race in 2005 with a car developed for the Grand Challenge held in the Mojave Desert by the Defense Advanced Research Projects Agency (DARPA); and a second car runner-up in DARPA’S 2007 Urban Challenge - the team is hoping to be the fastest up the mountain with this remote controlled Audi. Other autonomous vehicles have reached the summit but only at speeds of around 25 mph, say the team. This new car will follow a GPS trail from start to finish. It has reached speeds of over 200 km/h without a driver on testing grounds at the Bonneville Salt Flats in Utah. Its GPS system corrects for interference in the atmosphere, showing the car’s position on the Earth with an accuracy of less than 2 cm. The remote control Audi measures speed and acceleration with wheel-speed sensors and an accelerometer, and gets her bearings from gyroscopes, which control equilibrium and direction. “The computer puts all this information together and then compares it to a digital map to figure out how close the car is to the path that we want it to take up Pikes Peak,” said Gerdes. The team says that the computers in the boot space will plug into the car’s existing electric steering system and the car will move into action with stock automatic gear shifting and brakes with an active vacuum booster, a feature that normal cars use for emergency braking. 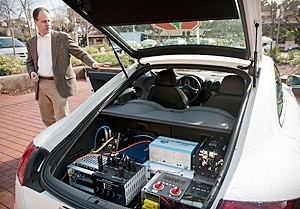 Using complex algorithms, the researchers have programmed the car to handle like a racecar. For example, as the car approaches a turn, it calculates a ‘best guess’ on steering and acceleration. Audi’s steering system normally responds to the steering wheel, but since there is no driver, it responds to algorithms that combine information such as the GPS path and inertial movement picked up from its sensors. The end of driving as we know it is almost finished. Formula 1 cars will not only be in contact with the pits, they will be driven from the pits! The world’s population is aging rapidly, with implications in numerous areas, not the least of which is that the number of male drivers over the age of 70 will double in the next 20 years, and the number of female drivers over 70 will treble. Does this pose a greater risk on the roads? A new in-depth report released by the UK’s IAM (Institute of Advanced Motorists) contradicts the common assumption that older drivers are a danger on the roads, comprehensively proving that drivers over 70 are no more likely to cause crashes than any other driver, and are indeed, considerably safer than younger drivers. The report shows that older drivers are safer than young drivers. Just eight percent of drivers are currently over 70 years of age, and they are involved in around four percent of injury crashes; fifteen percent of drivers are in their teens and twenties but are involved in 34 percent of injury crashes. Age-related decline in mental and physical abilities can make older drivers more prone to certain types of crash though, and this is exacerbated by age-related frailty which makes older drivers more vulnerable to serious injuries. An elderly person’s risk of being killed or suffering a serious injury as a result of a road crash is between two and five times greater than that of a younger person because of their increased physical frailty. However, the IAM analysis pinpoints no particular age at which an older driver’s functioning and skills suddenly deteriorate to the point where driving becomes too difficult or unsafe. Older people rely heavily on their cars, and the ability to drive gives many older people better mobility and access to more activities. Men in their seventies make more trips as car drivers than men in their late teens and 20s. “The IAM recommends that, rather than seeking to prevent older people from driving, we need to make them aware of the risks they face, and offer them driving assessments to help them cope with these risks,” said Neil Greig, IAM’s director of Policy and Research. “The IAM strongly believes that there is no case for compulsory retesting of older drivers at an arbitrary age. More research is needed on the best age to renew driving licenses and there needs to be a wider debate on the introduction of restricted licensing,” said Mr Greig. Drivers over 70 are safer on bends and overtaking than 50 year olds, but are more at risk at roundabouts, junctions and slip roads on high speed roads. In some traffic situations, older drivers are less likely to be in a crash because they tend to adopt a more careful and restrained driving style. No particular age was identified where there is sudden increase in crash involvement. Older drivers self regulate and take fewer trips on motorways, in poor light or wet weather, or at peak times. Drivers over 85 are four times more likely to have caused a crash than to have been an innocent victim of one. Crashes in which older women are to blame peak about five years earlier than those for older men.